Aya Imamura shows her work in progress at the open studio in Schloss Plüschow. 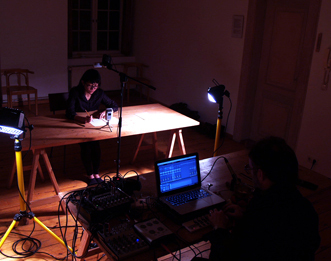 From 17:00, Aya and sound artist William "Bilwa" Costa have a performance, sound/map 2.0 in Schloss Plüschow. sound/map is a collaboration between Aya and Bilwa. Bilwa produces 3-d sounds around Aya, using a sound system and raw materials. Aya maps the qualities and architectural coordinates of these sounds, using a system of numbers.